After the release of the first Telstar (the first "dedicated-chip" pong system) in 1976 which was a big success, Coleco conceived a whole range of pongs for release at Christmas 1977. 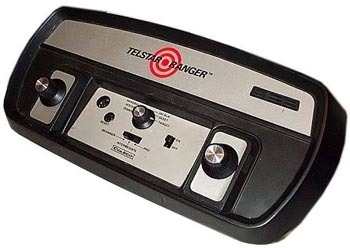 This is the first Telstar featuring the two shooting games of the GI AY-3-8500, hence its name "Telstar Ranger". It thus offers a total of 6 games which can be selected through a special knob. Despite the pictures beside, the two small controllers are not built-in the console and can be detached. see more Coleco Telstar Ranger Ebay auctions !